Here is an important surprise pleasure. Again and again one comes up against the insularity of Britain's musical diet. 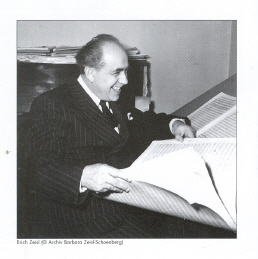 This first release of songs the first CD devoted to Erich Zeisl (1905-1959) - whose name was new to me and probably is to many readers - celebrates his centenary. Before he emigrated via Paris to USA (Los Angeles, where he lived until his sudden, premature death) he had composed a hundred lieder in Vienna, 'the cornerstone of his art'. He liked to set texts of literary merit, in many genres but always with a dramatic content, however brief they might be. Melody is at the forefront, but harmony (often subtly spiced) and pointed word painting in the piano parts give distinction and distinctiveness to many of the songs. There are many moods, nature pictures, sombre thoughts about mortality, humour in plenty. Many are very short, but the four last of the 28 tracks are given to the more expansive Mondbilder of Christian Morgenstern. The performances sound to me ideal. Holzmair is in fine voice and his is a characterful baritone, one of those voices that are easy to recognise. His accounts of these songs are always in appropriate scale, making the CD ideal for intimate, home listening. Cord Garben is a fine partner, and the balance is so careful that there is no question of soloist and accompanist. Production is fine too, with parallel texts in German and English. 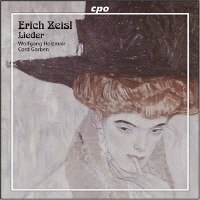 Following our pleasure in discovering Zeisl's lieder, here now is a sensational piano concerto, not so for its flamboyance or virtuosity, but for very different musical values. There is an orchestral fugato (and others in the second and third movements too) and complex treatments of the main theme in "characterful transformations", respectively percussive, rhapsodic and jesting, with a thrilling peroration. The middle movement is more reflective with a peaceful coda, before a finale which "juxtaposes and ultimately reconciles the spiritual and the earthly". It is original more than derivative, but fleeting thoughts of Reger and, more, Franz Schmidt (whose own piano concerto deserves to be known) may give an indication of what to expect. The fill-up, a 1935 suite from a then still unperformed one-act ballet, also brings Schmidt more to mind. 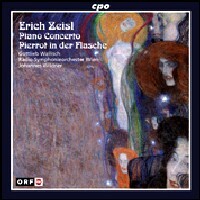 But the piano concerto is the reason to acquire this CD, well played by Gottlieb Wallisch and satisfactorily balanced with the Vienna Radio Orchestra. Until the BBC takes it up, Zeisl's piano concerto is waiting for an enterprising young pianist to persuade one of our college orchestras to programme it - and maybe make his/her name thereby.